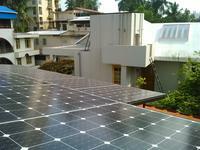 Solar power in India is a fast growing industry. As of 30 April 2017, the country's solar grid had a cumulative capacity of 12.50 GW. 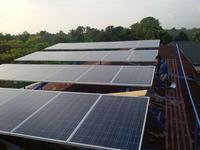 India quadrupled its solar-generation capacity from 2,650 MW on 26 May 2014 to 12,289 MW on 31 March 2017. The country added 3.01 GW of solar capacity in 2015-2016 and 5.525 GW in 2016-2017, the highest of any year, with the average current price of solar electricity dropping to 18% below the average price of its coal-fired counterpart. It is the largest solar producer, and Welspun Energy is one of the top three companies in India'srenewable-energy sector. A planned 750 MW solar-power plant in Rewa district will, when completed, be the world's largest solar-power plant.